Ladies and gentleman, Six Flags Great America has done it again with maximum force roller coaster. 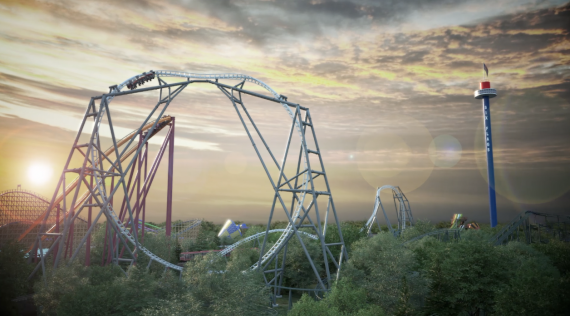 For 2019, the Gurnee amusement park just announced last week that they will be adding a 17th coaster to their lineup of thrill rides. Not to mention this new coaster will be breaking three records!? 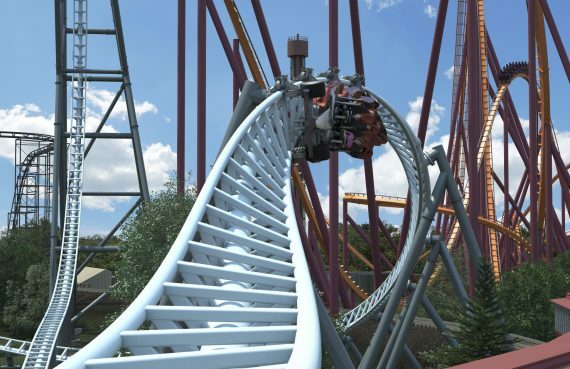 The 2019 coaster is called Maxx Force. This magnificent piece of equipment intends to be the fastest acceleration in North America taking riders from 0-78 mph in under two seconds, become the tallest inversion in the world and the fastest inversion in the world according to a Six Flags Great America (SFGA) press release. Maxx Force is the fourth new ride in as many years joining JUSTICE LEAGUE: Battle for Metropolis, THE JOKER and Mardi Gras Hangover, respectively. So you may be wondering, besides the speed, the inversion and the inversion (get it? Double inversion? Is the dad pun working? ), what else makes this new coaster so unique? Maxx Force is a unique air-powered launching system propelling guests forward at record speeds (78 miles per hour at its top speed). The trains on these cars mirror Formula One race cars. This isn’t the Gurnee amusement park’s first rodeo with the Guinness Book of World Records. In 2015, the experts who work for the book of feats visited Six Flags Great America to view the credentials of Goliath. After it was said and done, Goliath is officially Guinness Book of World Record certified as the largest, steepest and fastest wooden roller coaster in the world. The 2018 coaster of the year, Mardi Gras Hangover, is considered to be the world’s largest loop coaster. To make room for this record-breaking coaster, the Gurnee theme park waved farewell to the Pictorium IMAX theater along with Southwest Territory Amphitheatre. To learn more about the rides and roller coasters at Six Flags Great America, continue here. Stay tuned for the Fright Fest presented by SNICKERS guide.